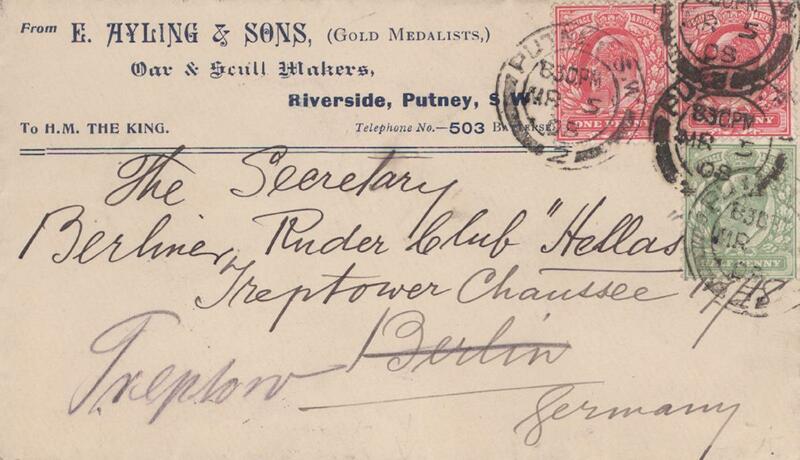 An envelope from E Ayling & Sons in Putney, addressed to the Secretary at Berliner Ruder Club "Hellas" in Germany, dated March 5 1908. Cream coloured envelope with blue printed address and telephone number, three postage stamps in the top right corner (two red, one green) black ink stamp over the top with the date. Purple Aylings stamp reading "Ayling's Oars and Sculls, hold every record at Henley Royal Regatta Diamond Sculls 13 seconds! ".